If you want to stream 1080p HD content from your laptop or mobile device to your TV, without having to worry about using different boxes with different devices, we’ve got just the thing. 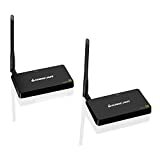 The IOGEAR Wireless HDMI TV Connection Kit consists of a receiver box that you connect to an HDMI port on your television, and a transmitter box that can be anywhere within 150 feet. Just connect your laptop, tablet, or smartphone to the box’s HDMI-in port (you’ll need a Lightning to HDMI cable or adapter for an iOS device) and you’re good to go!